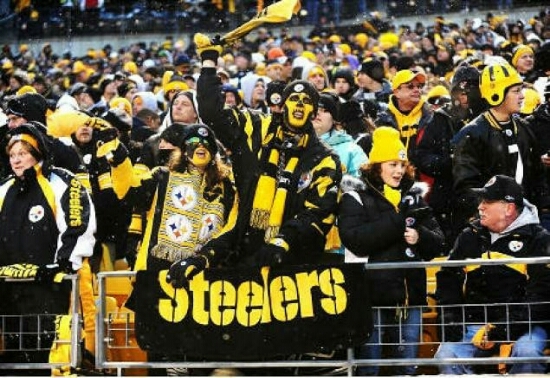 Steelers Fans Much Better Than Meaningless Ranking Shows | "IT'S A STEELERS WORLD"! Either Jeremy Bergman of NFL.com is an idiot, or he like so many others can’t help but hate on the most decorated team in the National Football League. A study from Emory University that ranked the NFL’s “Best Fans”.. Wait, hold on a minute..“Emory University “? You mean the bottom of the barrel, division III school that has no football team? They are the knowledgeable geniuses that did this study? LMMFAO!!! The criteria apparently included attendance, prices and revenues. Basically if a fan base spent a lot of money on the team, they ranked high. Umm..a pretty moronic way to determine which teams have the best fans. But I guess that’s just me. Maybe I’m the one who doesn’t know nothing. Yeah..right. Besides that, what makes this study even more of a joke..the top ranked team according to this less than prestigious university was the Dallas Cowboys. Following them in this order were the New England Patriots, New York Giants, Baltimore Ravens, and New York Jets. ” WTF”? Are you serious right now? The Dallas Cowboys? They have the best fans in the NFL? You mean the same Cowboys fans that praised Tony Romo one minute..burned his jersey the next..then jumped on his jock again after a better than normal season last year? Those flip floppers? Yeah, ok.
Then to rub salt in the wound they plopped the Cheatriots in second place, something I can somewhat understand.. but no way in Hell agree with. I guess it’s like the significant other with low self-esteem, if you cheat on them..they’ll always forgive you because they can’t get anybody better. Then there are the Ravens fans. Who I can admit are pretty decent fans, still nothing to write home about or place in the 3rd spot. But then again what else do they have? Either they stay loyal to the Ratbirds..or they re-transplant back to the Cleveland and ride with those Stains. Leaving the Giants and the Jets out of the crossfire because I personally..”do not” hate them like the previous three, I will now address the team more importantly at hand. Where were the Pittsburgh Steelers ranked? “Fourteenth”! A two team over .500 14th! Can you believe that crap?And Jeremy Bergman went as far as to call Steelers supporters “pretty average”, and all I have to say about that is..”you are an idiot indeed, Bergman”. The last I checked, I have never seen Cowboys fans walk around with their jerseys on after a team loss..or Patriots fans outside of the state of Massachusetts taking over a stadium in a sea of blue and silver..but I’ve seen Steelers fans do both. I’ve seen home team fans swallowed by the waves of the Terrible Towel, jerseys worn whether win, lose or draw and Steelers bars from California to Italy! So what exactly do you, Jeremy Bergman and Emory University have to say about that? I’ll tell you what..absolutely nothing. ” IT’S A STEELERS WORLD “..and don’t you forget it.